The models just haven't resolved anything worth chasing. The distance involved trumps any desire to see what develops. If it was local (meaning the EaTexPan or WeOk), yeah, I'd probably head out and have fun, but a 500 mile drive... no way José! Even the cold core in Kansas just isn't enough to bite on. Ouch. This one hurts. In all fairness, though, the models just didn't show me what I wanted to see to make the drive all the way down. It was inconsistency... it was not the shear profile I was looking for. You'd be hard pressed to find anyone who was forecasting anything more than a brief spin-up today, so I don't feel too bad I guess. Congratulations to Johnathan Skinner who just so happened to be staying with friends in Elk City last night! He told me that it just so happened to be right where he was targeting, so that worked out VERY well for him. Undoubtedly, we would have met up with him at some point and time today, but there is a long list of "if's" that I could get into tonight. Anyway, we'll leave it at that for now. Today at work, I spent a good deal of time on new product creation. I wanted to make a CAPE product that had CIN overlaid on it, basically blocking out the CAPE when the CIN is strong enough. In the example below, the CIN (pink-purple) is opaque at -100J/kg. At values between 0 to -100, it is translucent, thus allowing you to see the CAPE(blue-green-yellow) below it. The CAPE is translucent below 200J/kg or so and the blue colors stop at about 500J/kg where they switch to green. Yellow is 1500-2500J/kg and above that (but not shown) it goes to orange and red and finally a light (not bright) pink at about 5000J/kg. 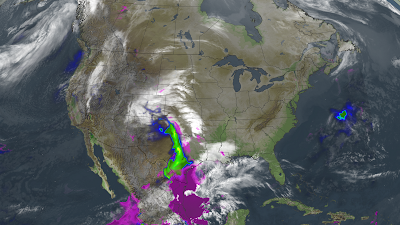 I put the parameters (in this case the 21Z valid time from today's NAM 18Z run) with IR and VIS sat images. CLICK ON IMAGES FOR A MUCH LARGER VIEW!!!! Got a nice deal on a barely used one for about $650. I'm hoping it will pay for itself over the course of the year! I'd be interested in hearing from anyone who has this camera. Thoughts? Anyway, that's it for tonight. 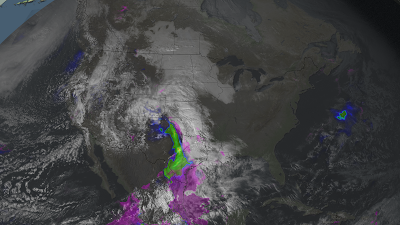 I'm still feeling a little ill for missing that storm today and dumping a bunch of money into a camera. Congrats to all who bagged on today. Thank goodness no one was hurt. That setup sure didn't look like much even when it was at it's best, amazing what came out of it. Nice cam too, you will have fun with that. Congrats on the new camera! I just ordered a new HD Canon HV40 from B&H. I still can't believe I scored on the 8th. I wouldn't have been more surprised getting eaten by a grizzly bear here in Amarillo than I did seeing that large tornado on such a meager day. Hope your 2010 chase season goes good my friend!